Patients receive a comprehensive examination, consultation and educational review, diagnosis and treatment of surgical disorders. The practice encompasses all aspects of general surgery including gallbladder, ulcer, hernia, colon, and endocrine procedures. 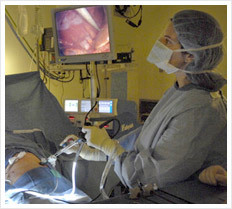 Special interest lies in advanced laparoscopy and minimally invasive surgery. Other laparoscopic procedures include ventral incisional hernia and inguinal (groin) hernia repair, colon resection, appendix removal, lysis of adhesions (removal of abdominal scar tissue). Office procedures include abscess drainage, cyst or mole removal, and others. Please call 410-571-9499 for more information. We will be happy to address your questions and concerns.